The Transformative Studies Institute (TSI) offers expert progressive speakers and commentators for roundtable and panel discussions, public events, and all media including news, analysis, general interest, and more. Fees depend on the presenter and occasion. However, we do request that speakers be compensated for reasonable expenses such as travel, accommodations, meals, etc. Dr. Steven Best is Associate Professor of Humanities and Philosophy at the University of Texas, El Paso. For 25 years, he has researched, taught, lectured, and published in areas such as philosophy, literature, social and political theory, cultural studies, film and mass media, science and technology studies, politics, terrorism and peace/security studies, and ethics. He is author and editor of 10 books and has published over 100 articles and reviews on diverse topics. In addition, he is Executive Director of the Institute for Critical Animal Studies (http://www.criticalanimalstudies.org/). In 2007 he was included in the Animal and Society Institute’s Guide to Experts on Animal Issues, and the national vegetarian health magazine, VegNews, voted him as one of the nation’s “25 Most Fascinating Vegetarians.” A noted public figure, he has been interviewed on a wide range of issues by media such as National Public Radio, the Los Angeles Times, the New York Times, BBC News, the Guardian Independent, The Chronicle of Higher Education, The Philosopher’s Magazine, as well as media in Brazil, Barcelona, France, South Africa, and elsewhere. Many of his writings can be viewed at http://www.drstevebest.org/. To contact Dr. Best please email: best@utep.edu. Dr. Jason Del Gandio (rhetoric4radicals@gmail.com) is an Assistant Professor of Public Communication at Temple University. He specializes in rhetoric, the philosophy of communication and language, critical analysis, radical social and political theory, and to a lesser extent, performance studies. He participated in the global justice movement in the early 2000s and went on to fair trade activism, Latin American solidarity, and anti-war activism. These experiences inspired Jason’s first book, “Rhetoric for Radicals: A Handbook for 21st Century Activists” (November, 2008), which received the Gold Award by the Independent Publishers Industry in the social activism category. He also offers workshops for activists on communication and rhetoric. He is now working on his next book, which focuses on the political relationship between communication, desire, and the creation of reality. In general, Jason is an intellectual activist dedicated to social justice. More information can be found at www.jasondelgandio.com. Dr. Richard Gilman-Opalsky is Assistant Professor of Political Philosophy in the Department of Political Science at the University of Illinois at Springfield. Dr. Gilman-Opalsky earned his Ph.D. in Political Science at The New School for Social Research. His MA (The New School for Social Research) and BA (Hofstra University) are in Philosophy. Dr. Gilman-Opalsky’s research areas include the history of political philosophy, continental and contemporary political theory, socialist philosophy, critical theory, and post-structuralism. His teaching and research is centered on questions of radical democracy, social movements, revolutionary theory and practice, capitalism, and socialism. Recent research and articles have focused on French theorists Guy Debord and Jean Baudrillard, and also on Jürgen Habermas and theories of the public sphere. Dr. Gilman-Opalsky is the author of Unbounded Publics: Transgressive Public Spheres, Zapatismo, and Political Theory (Lexington Books, 2008), as well as numerous articles. To contact Dr. Gilman-Opalsky please email: rgilm3@uis.edu. Sviatoslav V. Voloshin, Director of Development has a background in International Relations & Diplomacy. To contact Mr. Voloshin please email: svoloshin@transformativestudies.org. Cultural Differences between the U.S. and the countries of the former Soviet Union and Eastern Europe. Doing business in Russia: what to expect. Traveling in Russia (visas required). Challenges in getting married abroad. Challenges in bringing your spouse to the U.S.
Hidden Symbolism of Washington, D.C. Starting a non-profit organization 501 (c) 3 from scratch: what is involved. Dr. Richard J White is Lecturer of Economic Geography at Sheffield Hallam University, UK. To date, Richard’s main area of research has focused on exploring the geographies of the informal economy in the Minority World/ advanced economies generally, and in particular through understanding community self-help, mutual aid and reciprocity. His research, focused on both affluent and deprived communities, has critically challenged many dominant myths that surround our understanding of contemporary work and exchange in “capitalist” society. In addition to disseminating his research through peer-reviewed journals, Richard has formally participated in conferences and seminars to International and European audiences (ranging from local policy making communities and think-tanks, to high-profile academics, and senior government officials). Richard’s broad teaching and lecturing profile includes: re-thinking the economic in economic geography; philosophical approaches to space and place; alter-globalization groups; the use of direct action within human and animal liberation movements; dissident and moral geographies; and critical pedagogy. Finally, Richard is also currently serving on the Editorial Boards of “The International Journal of Sociology and Social Policy” and “The Journal of Critical Animal Studies” and “Theory in Action, The Journal of the Transformative Studies Institute”. To contact Dr. White, please email: Richard.White@shu.ac.uk. Dr. Ali Shehzad Zaidi, Director of Publications, has a doctorate in comparative literature and master degrees in Spanish and English literature. 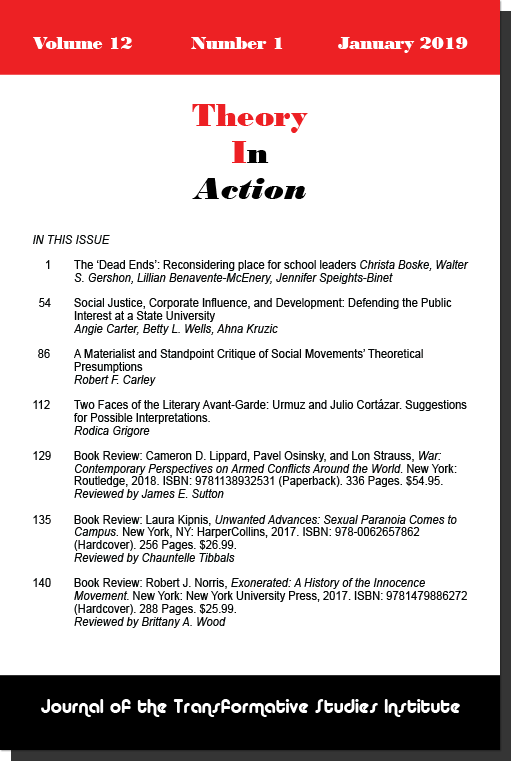 Several essays of Dr. Zaidi’s can be read in the Social Justice and Activism section of the TSI website under the heading “Social Justice Papers.” To contact Dr. Zaidi, please email: AZaidi@transformativestudies.org.